Jensen Motors sign dating from the 1950s. 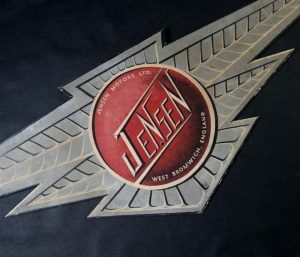 The sign made from cut ply-wood of large dimensions, and hand-painted with the Jensen Motors logo. Size: 151cm x 45cm. The sign fitted with a thin wire to the reverse allowing for hanging. The sign is thought to have been made in-house by Jensen staff, and is believed to be unique. The nature of the hand painting shows clear talent, particularly in regard to the red centre, where various tones of red are used to give three dimensional effect. Even the clever use of both black and white highlighting to the grey sections, gives a feeling of depth. Close-up showing the paint work. The reverse of the ply-wood has been painted with a white finish, probably more as a final finishing by the painter, rather than to add any protection. Just off from centre there is a drilled hole, and this may have been contemporary work, allowing the sign to be both screwed to a backing post, or hung from the wire if required. 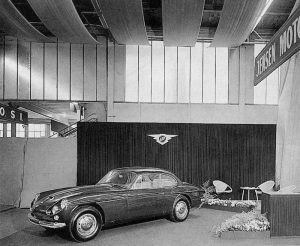 The Jensen sign on prominent display at the 1964 Motor Show. 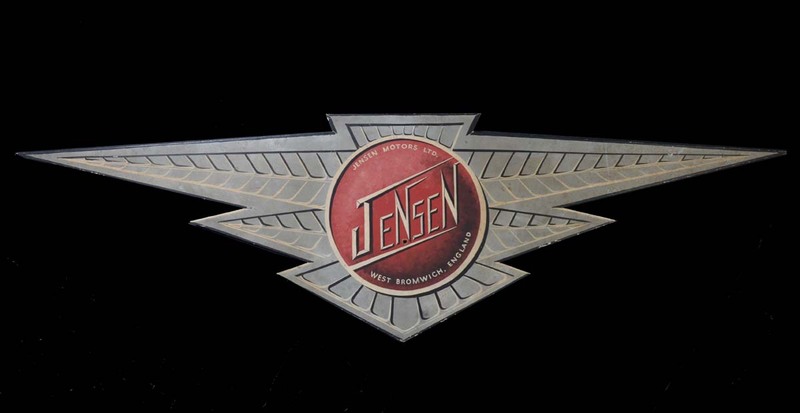 The Jensen Motors sign was displayed at Motor Shows, and continued in use through to 1966. By then the new Jensen Interceptor took over from the CV8, and this sign was then superseded by acrylic signage. This more modern form of signage complimented the new age of the Interceptor & FF. 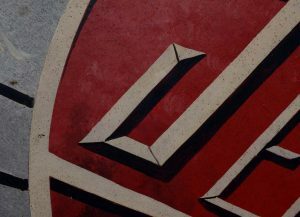 After being superseded by acrylic signage, this hand-painted sign was relegated to one of the store rooms at Jensen Motors. After the company’s demise in 1976, the sign remained in storage with Jensen Parts & Service. The sign was acquired from Jensen Parts & Service by the Dutch Jensen specialist, Paul Vierhout, in the 1980s. The sign was on display at his premises in Holland until his death in 2013, and was then acquired by the Museum. REQUESTS: The Museum is interested to hear from any former employees of Jensen Motors who may remember this sign, or indeed from anyone who may have images showing the sign in use. See additional information.